Combine all crust ingredients and pat into the bottom of a 9x13 dish. Bake at 400 for 7 min; let cool. 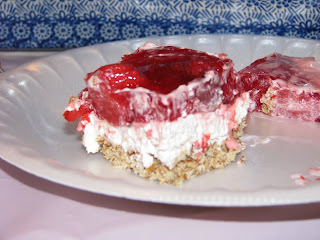 Mix together all of the cream layer ingredients and spread over the pretzel crust. Dissolve jello in water and add remaining ingredients. Chill until about set and then pour over the cream cheese layer. Chill until ready to serve. This is addicting, the combination of salty and sweet is perfect!